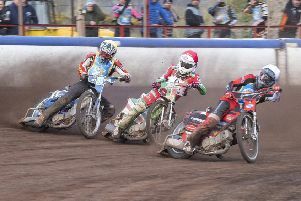 Two long-time Edinburgh Monarchs speedway enthusiasts are teaming up to organise a fundraising event for the Capital club following a spate of rain-offs at Armadale this season. Meeting presenter Scott Wilson, who has filled that role since 1997, and Derek Wilkinson, boss of Monarchs’ official transport supplier Duddingston Private Hire, have launched Monarchs 100 and are inviting a hundred Monarchs supporters to walk the Forth Road Bridge on Sunday, August 28. Duddingston Private Hire will provide courtesy transport to and from the bridge and there will also be a small lunch laid on by the Black Bull Inn at Mid Calder. While Monarchs insist there is no financial crisis in the wake of five home washouts and several other rain-affected meetings, the club have been hit hard by the weather and have asked supporters to turn out in greater numbers for the rest of the season.